Kay had always been employed working with livestock around cattle auction environments and had a love for animals in general. She was unfortunately made redundant and wanted to continue working with animals but was encountering difficulties finding work. She considered finding alternative employment in hospitality but this wasn’t her passion and decided to open herself up to other opportunities. While claiming job seekers allowance, her Job Centre Work Coach suggested getting involved with Vestia. Kay became engaged with Vestia and enrolled on a nine day employability course that provides an accredited qualification on course completion and focuses on giving all the tips and tools needed to secure work. Following the course, Kay continued to work with Vestia, visiting the drop-in jobs club that Vestia deliver twice a week at Community House and Stourport Library. Course Tutor, Darren Robinson, said: “Kay was great on the course, she got involved with all the course actvities and used her personality to engage well with other course delegates. 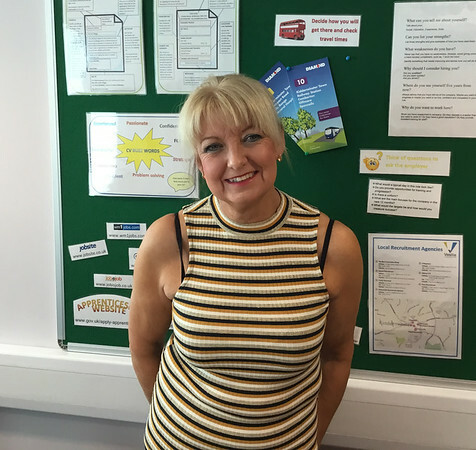 Even after the programme had finished, Kay was determined to secure work and attended the jobs club every week ensuring applications for work were being made”. A couple of months later, Kay was successful in securing a marketing/sales position for a company named eXPD8, who are a field marketing agency that provides retail support services to retailers, suppliers and manufacturers across the UK. When we caught up with Kay, she was in the process of agreeing a start date with eXPD8 and looking forward to getting back into the workplace. If you are looking for a job or have been out of work for a while Vestia Employment Services can help. For more information, phone a Vestia Jobs Coach on 01562 733133, or email jobscoach@vestia.org.uk to take your first steps in getting into work.